This is a versatile game that promotes teamwork and communication and that multiple group sizes can play. The goal is to figure out how to untangle the human knot without letting go of hands. Having a camera on hand is also recommended for some fun candid shots! Form groups of about 10 people each. Have each group standing, facing towards each other, in a circle. Each person should be standing shoulder to shoulder. First, instruct everyone to lift their left hand and reach across to take the hand of someone standing across the circle. Next, have everyone lift their right hand and reach across to take the hand of another person standing across the circle. Make sure that no one is holding hands with someone standing directly beside the person. 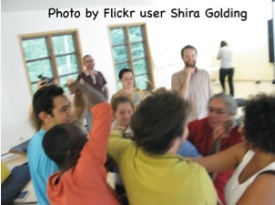 To play, the groups must communicate and figure out how to untangle the knot (forming a circle of people) without ever letting go of any hands. Folks may need to shift their grip due to the angle and bodies, but they should not let go. The game typically takes 15-30 minutes to complete. You can impose a time limit if you wish to make it more challenging. When you are done with the Human Knot activity, ask some debriefing questions such as “How well did you group work together? What strategies did your group adopt? How did it feel to solve the puzzle?” etc. Variations: To increase the difficulty level, you can either (1) blindfold some of the players or (2) require that the game be played silently (no talking).